The Neater Feeder® is designed with protective walls tocontain splashes and spills from an inadvertent kick or an excited pet. This revolutionary system holds spilled food in an upper reservoir while spilled water flows down a gentle slope through a patent-pending filtering system. 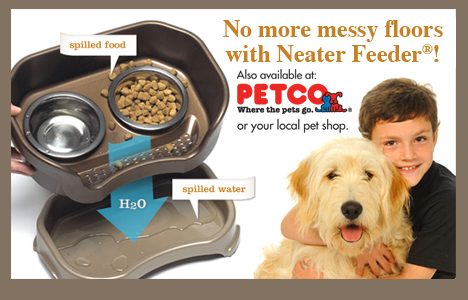 View a demo online today and see why the Neater Feeder is the most award winning pet product ever! Plus, get FREE shipping when you use code MPV1 at checkout.